In the class, which takes about 5-6 hours, with a good portion of the wood pre cut you learn how to use a saw, nailer and drill. The decision was made to slightly modified the plans and used a nailer for some components and longer screws in other areas but all in all the plans were followed fairly closely. We also added wheels to the bottom of the cart for mobility. We started with the kit that Simpson Strong-Tie makes and sells at Home Depot. You can get one here. Then bought additional self tapping screws and the wheels aren’t included but its cheaper than buying everything separate and comes with plans for some neat projects! The plans we built to, can be downloaded here, for FREE! First, We built our own cart! I cut all my own wood, built and painted in about 4 hours. Not bad! I even showcased it on Show Me St. Louis, which I am on every 2 weeks! We have done 2 classes with a total of 12 awesome ladies! Here is just a little peak at what the class has to offer! Class starts with all these goodies! We started with all the wood for the base and then cut the wood for the top and bottom shelves. There are soo sooo many screws in this bad boy but hey, at least you know its solid! The class is really meant to show you that you CAN do this and to get your wheels turning on what you can do at home! They turned out so so so good! Everyone was so so proud of themselves! And I love how they all turned out different! For the second class, we streamlined things even more. All the wood is cut first, painted and/or stained and then we put it together. If you are going to paint your metal brackets we recommend doing this first as it takes a while to dry. If you paint first, touch ups are super easy later. Once the entire cart is together, is when we used Modern Masters on it to seal it. Its UV protected and can stand up against acid rain! And with a ton of hard work and patience theirs turned out just as good! 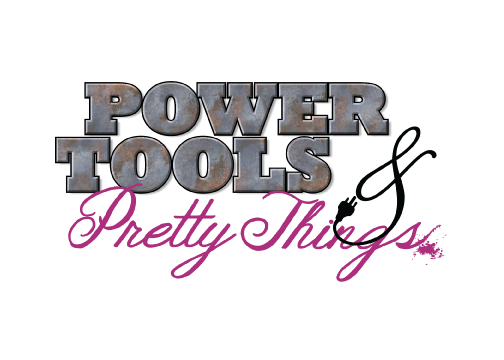 We will be offering more Power Tools & Pretty Things classes where you can get YOUR feet wet with us and you can view our schedule and register here! If you download the plans for this barcart and tackle them at home, please share pics with us! ← Facebook: 25k Family Member Celebration!